A 16th-century ghost helps her present-day descendant preserve the past, in a story by American-Israeli Ragen (The Sacrifice of Tamar, 1994, etc.) that’s as much a heartfelt plea for continuity as a family saga. When 74-year-old Catherine da Costa is told that her illness is terminal, she finds herself worrying more about her family’s future than about her own death. Catherine is the only descendant of Hannah Mendes (a real historical figure), who escaped the Spanish Inquisition, did business with kings, and enlarged an already great fortune made from the spice trade. Now the only heirs to whom Catherine can leave the family’s relics—religious objects, Hannah’s Hebrew Bible, a few pages of her memoirs—are her granddaughters Suzanne and Francesca. Catherine’s daughter Janice married out of the faith and shows no interest in the ancestral past, but, unfortunately, the granddaughters aren’t promising material, either: both, in their 20s, are alienated from the family, not religiously observant, have had unsatisfactory relationships, and are still unmarried. Then, while napping in her chair in her Fifth Avenue apartment, Catherine is visited by Hannah’s ghost, who comes up with a plan to ensure the family’s survival. Shamelessly holding out the promise of money, she meets with her granddaughters and asks them to indulge her by going to Europe to track down the remaining pages of Hannah’s own memoirs, begun in 1574. Suzanne, more interested in good causes than family history, and the ever-practical Francesca, not one for the unplanned life, accept reluctantly, but soon find themselves caught up in the search. 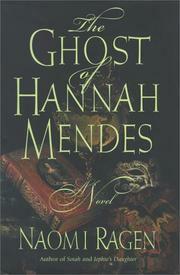 As the two young women travel, they have their own encounters with Hannah (her story alternates with theirs), and both fall in love with very suitable Sephardic Jews—Gabriel, a doctor who shares Suzanne’s humanitarian concerns, and bookseller Marius, who teaches Francesca to be more carefree. The future assured, Catherine and Hannah can depart in peace. A glossy celebration of culture and family, inevitably a tad schmaltzy but, like Ragen’s previous work, an agreeable enough read.